Tags: indian food, Indian Style, kati roll, thali. Customers take a look at our overhead menu and declare out loud. ‘’I am confused, I feel like I need a college degree in this menu to understand it”. I usually put them at ease assuring them it’s not an uncommon reaction for a virgin Kasa diner. Only the brave actually express their confusion. From this side of the counter, it’s an interesting anthropological study to see how humans handle their confusion. There are a handful of typical responses we see, all accentuated by the primal urge of hunger. Anger – It’s all someone else’s fault. The menu creators are just plain stupid and we are sternly informed of this. Embarrassment – followed by the backward quiet skulk away pretending they were never there. Frustration – A process of struggling through the menu but persevering. Excitement – A precious rare few gems get excited about swimming in unfamiliar territories. Rubbing their hands together, eyes sparkling they cannot wait to try something new. Rational – There exists this straightforward group who simply ask questions or samples in a neutral manner to decode and decide upon their choices. I fall into category one unfortunately. Angry and frustrated with my confusion having to be someone else’s fault. Having observed this phenomenon for a few years now, I have been actively pushing myself into the questioning and excited categories. Life is just easier and more fun that way. Warning can be a tad messy but we refuse to compromise taste for elegance. Use your hands to pick it up, and eat it like a hot dog or burrito. This is the best way to eat a Kati Roll. Use napkins to catch the tasty drippings. I like to use a spoon to scoop the Raita on top of the Kati Roll bite that I am about to consume. Easier than dipping the whole roll into the raita. You could try eating it with a knife and fork. I have seen it done more frequently than I would have expected. I suppose if you are of that society type (like George Constanza) and just don’t want to mess up your hands go for it . If it’s a ‘to go’ roll. Please DO NOT open the entire foil wrapper at once. Open it like a burrito and eat. Unfold it little by little in a spiral motion, so the roll stays in tact. Use napkins or the bag to catch the sauces…Pour the raita cup over each bite slowly as you go along. The Super Kati – is less messy as the rice inside soaks up the delicious sauces and chutneys. It’s more like a burrito. 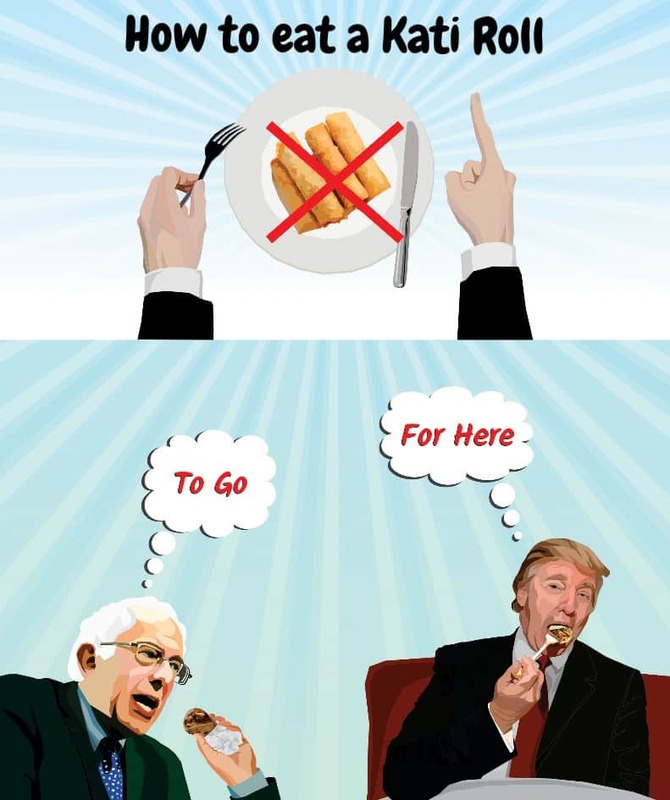 You may use a fork for this! Traditionally vegetables or meat with a dryer spiced sauce base are eaten with the breads. Roti is the lighter option eaten almost daily with light vegetables, meat dishes and daals. Naan is eaten with richer dishes and mostly eaten for special occasions. Rice is generally eaten with saucier dishes like the chicken kofte, chicken tikka masala and lamb curry. Rice and Daal is a classic combo. However it’s not a rule. You can also eat Roti with these dishes. The salads, chutneys, and raita are all condiments. You add a little bit of this or that with each bite. It keeps the flavours changing as you eat your meal so you don’t get bored halfway through. (maybe that’s just something that happens to me). It’s ultra personal as to what combinations you end up liking together and there are no rules. The salad and the raita are the cooling components to the heat in the rest of the food and gives your taste bud a break from the spices. 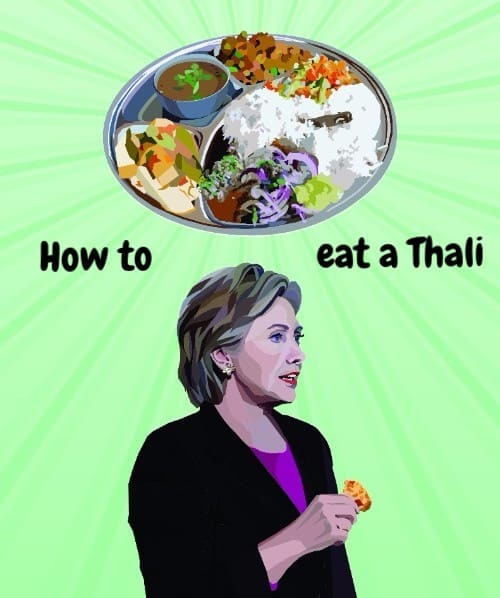 How do I eat a Thali authentically? Technically you use your hands for the roti. The roti is torn into bite size pieces with just one hand (two is for kids or novices). You then use the roti almost as a utensil to pick up the main dish by making a scoop out of it. If it’s the chicken, you would scoop a piece of chicken in the roti and dip it in the sauce, dip it in some raita if you like and pop into your mouth. Half way through chewing you would add a little salad to get some crunch and change up the taste. The rice is also often traditionally eaten with your hand. Many people prefer using a spoon or folk these days. It takes a lot of practice to use your hands to eat rice. Use the spoon to scoop some daal over the rice, mix in a little chutney and vegetables and make your bite. If you’re brave, add in a little hot sauce. Just a little at a time to see if you can handle it…. Finally – evolving as we are. I’ve seen my kids as well as customers make mini tacos out of their rotis and eat it that way. Californian/Indian it is!